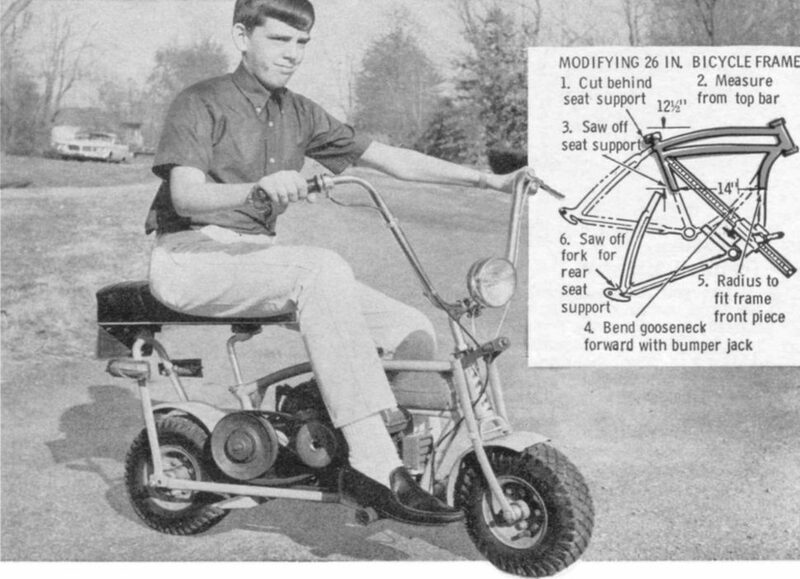 So did every single one of you build minibikes as a kid? One thing that struck us this week was how many of you had stories about building your own minibikes, typically from scratch, as a kid. And you all made it sound so easy, based on what you told us in the comments to the story on the English Mechanic car coming up for auction. Castings and machining aside, I feel much in common with the fellow who built this rig. 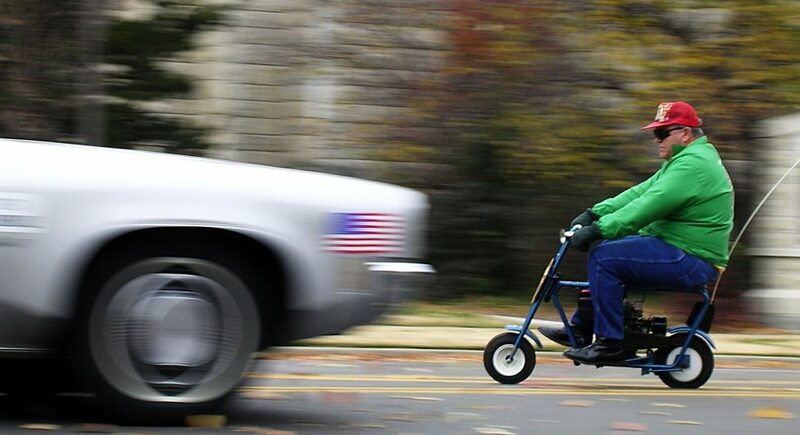 In 1961 I was 13 years old and wanted a minibike. My father, an aerospace scientist, said fine, you come up with the money and design it, and we’ll build it. I was gifted a defunct Briggs and Stratton engine that my father helped me over haul, and for six months I bought parts as I could afford them from places all over the Sacramento Valley. I used a much modified bicycle frame and cut many pieces with a hack saw out of steel plate and pipe. My dad took me to the welding shop and I came back with a frame. The only power tool we owned was a pre-WWII Sears electric drill which I used to drill necessary holes. Not only did the thing work, I terrorized the neighborhood with it for a year or two until I built a better one. I still build things, and still have two lathes in the basement, but now I restore old cars rather than build them. Only thing I have ever cast was babbit bearings. Ray, Your minibike building experience very closely mirrors mine. The gift of a used engine, drawing up plans, sourcing wheels and sprockets and chain, etc. Building the frame by cutting up a bicycle frame plus bits of plate and tubing and having someone weld it all together for you, then fitting all the parts, and finally painting it. The sense of accomplishment, skills developed, and the confidence to take on further projects that a young person gains from such an experience is literally priceless and will last a lifetime. Wow! I too built a mini bike after receiving an old B&S sideshaft motor. I had everything to build it laying around, and the Christmas before I had recurved a welder from my girlfriends dad as a gift. Used an old bicycle frame and some sturdy tubing from an old bedframe. The only parts I bought new were the seat and handlebars. The engine was a seized 5 horse Flathead Briggs & Stratton from the ‘60’s (I think). After soaking the block in penatrating oil for a week I was able to get it unstuck. Found a piston and rings in a buddies garage (he ran a small engine repair shop in his garage) and was able to get the rotating assembly back together. I milled the head lightly on a table sander and I used the carb from a John Deere riding lawn mower. The front wheel and fork was off a 10 speed bike and the rear tire was the big fat one also off the John Deere mower. It was so wide I didn’t even need a kickstand. It vaguely resembled a custom chopper mixed with a High Wheel bicycle from the 20’s. It was also faster than it could safely go. So much fun! Fellas, if you have photos, let me know and I’ll add them here. Same goes for anybody else who built their own minibikes as a kid. I’m gonna guess the bicycle-based minibikes discussed above turned out something like the one below, which we came across on VintageProjects.com. Maybe it’s time to go out and build another one, guys? BTW, regarding the English Mechanic car, Lawrence pointed out EnglishMechanic.com’s plans for sale on DVD, but it appears Google Books has also scanned back issues of English Mechanic from that era. Just in case any of you want to take a whack at building your own horseless carriage.